Aim: Displacement of gingiva is essential for obtaining accurate impressions for the fabrication of fixed prostheses, particularly when the finish line is at or within the gingival sulcus. Various newer impression materials have been introduced to achieve gingival displacement while recording the impressions. A comparative evaluation of these new gingival displacement materials was deemed necessary for efficacy in tissue management and dimensional accuracy. Materials and Methods: Ten individuals were selected according to the inclusion and exclusion criteria for gingival displacement using retraction cord impregnated with aluminum chloride and two polyvinyl siloxane impression materials (Aquasil and NoCord VPS impression system) according to Latin block design. Intraoral scanner and Vernier caliper were used to study and compare the dimensional accuracy of each die obtained following which the dies were sectioned and evaluated under optical microscope with image analyzer to measure the amount of gingival retraction. Results and Conclusion: Statistical analysis showed that the amount of gingival retraction obtained by using retraction cord impregnated with aluminum chloride as gingival retraction agent was maximum as compared to NoCord followed by Aquasil. All three gingival displacement techniques could produce gingival displacement >0.2 mm which is the optimum amount of retraction required for impression making. All the three materials are found to be dimensionally accurate. Newer gingival displacement materials have been introduced like NoCord by Centrix USA, which is a polyvinyl impression material which claims to produce gingival displacement along with making accurate impressions. Aquasil, as an impression material, has been introduced a long time ago, but its clinical efficacy as a retraction agent has not been tested. Therefore, a clinical evaluation and comparison of the efficacy of Retraction Cord, NoCord VPS Impression system and Aquasil on the basis of gingival displacement and the dimensional accuracy of the impressions was deemed necessary. The study was carried out after obtaining approval by the Institutional Ethics Committee of the institution. Ten individuals were selected between the age group of 25 and 30 years with good gingival health and thick gingival biotype., Individuals with thin gingival biotype, anterior malocclusion, crowding, rotation, diastema, restored anterior teeth, systemic diseases, and known allergy to material use, pregnant, and lactating women were excluded from the study. A written informed consent was obtained from each individual before the start of the study. Four impressions of each individual with unblemished, right maxillary central incisor were made; one predisplacement (control) impression with irreversible hydrocolloid and three postdisplacement impressions with knitted retraction cord (primecord) impregnated with 25% aluminum chloride by hemostat clear (Medicept), NoCord VPS Impression system, and Aquasil. Impressions for the predisplacement values of all patients were made using irreversible hydrocolloid from the cast obtained from the predisplacement impressions; 30 custom trays (3 for each patient) were fabricated with tissue stops on the adjacent teeth, allowing a space of 4 mm, for standardization of the amount of impression material used and accurate placement of the trays. Impressions were made using two-stage double mix impression techniques after 24 h of fabrication. For gingival displacement, isolation was done on the right central incisor with cotton rolls to maintain a dry working area. For Group 1 (Retraction Cord), one tray of each patient was used to make impression after gingival displacement with knitted retraction cord (primecord) impregnated with 25% aluminum chloride by Hemostat Clear (Medicept), and impression was recorded with Aquasil polyvinyl siloxane material. For Group 2 (NoCord impression), second set of trays for each patient was used to make impression with the NoCord VPS Impression system following manufacturer's instructions. Medium body siloxane material was used to make the base impression. The light body was injected into the gingival crevice using fine intraoral tips supplied with the material and was picked up with the medium body impression. For Group 3 (Aquasil), third set of trays for each patient was used to make impressions with the Aquasil impression material. After making the putty impression, the aluminum chloride (25%) by Hemostat Clear (Medicept) was applied into the gingival crevice with the intraoral tips. After about 3–5 min, the astringent was washed away. The tooth was dried, and light body was injected into the gingival crevice with the intraoral tips, and a pickup impression was made using the putty. A gap of minimum 7 days was kept between the 3 postdisplacement impressions of the same individual following the Latin block design to avoid tissue fatigue, which is presented in a tabular form in [Table 1]. All impressions were poured in die stone (Ultrarock, Kalabhai and Karson Pvt ltd, Mumbai) and retrieved with care to not damage any part while retrieving. 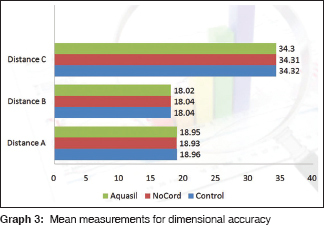 For the dimensional accuracy, the control group measurements were made using an intraoral scanner for maximum accuracy, and the casts obtained from impressions made using NoCord and Aquasil were compared with the control group. Three reference points were selected. 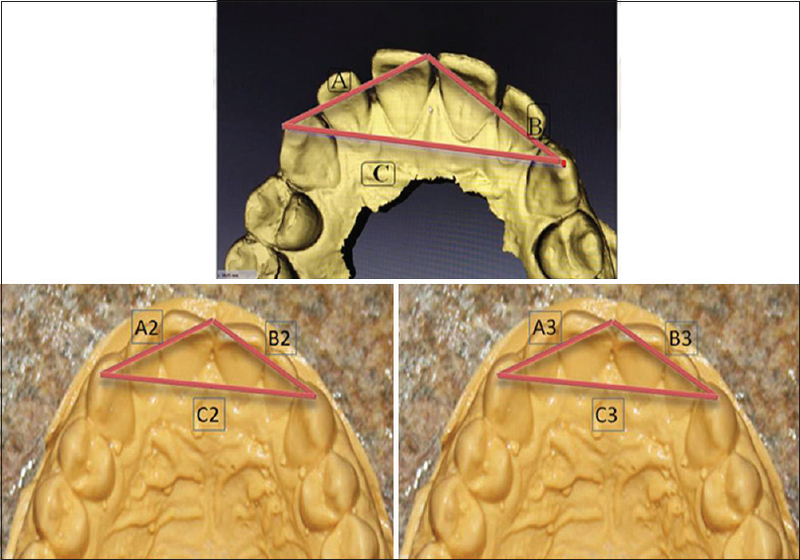 One reference point was taken from the mesioincisal edge of the maxillary right central incisor (A) and the other two reference points were selected as the canine tips of the right and left cuspids (B and C), respectively. 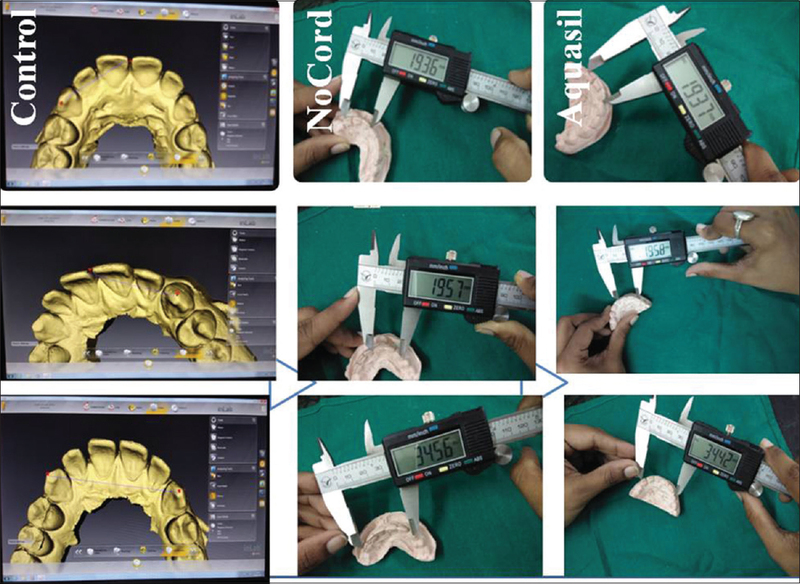 The distance between the three reference points of the intraoral scan was measured and compared with those obtained on the casts poured from the NoCord VPS impression and Aquasil impressions. The distance between the reference points of the NoCord impression casts (A2, B2, and C2) and Aquasil impression casts (A3, B3, and C3) was measured using Vernier caliper [Figure 1] and [Figure 2]. Mesiodistal width of right central incisor was measured with help of Vernier caliper, and the axial center of the tooth was marked on the cast. The cast was positioned and stabilized on the platform of die cutter, and the cut was made on the marked central portion of the incisor edge in the buccolingual direction through the entire length of the cast [Figure 3]. The sectioned die of the maxillary central incisor was observed under an optical microscope (using image analysis software) [Figure 4]. The predisplacement values were subtracted from the postdisplacement values of each sample for calculating the amount of displacement. 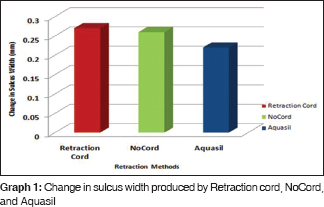 It was observed that the mean change in sulcus width obtained for the impregnated retraction cord was 0.271 with a standard deviation of 0.02, that for NoCord was 0.260 with a standard deviation of 0.02, and that for Aquasil was 0.22 with a standard deviation of 0.02 by one-way ANOVA test [Table 1] and [Graph 1]. The values were further subjected to post hoc test for multiple comparisons, and no statistical difference was observed between the retraction width produced by retraction cord and NoCord. The retraction width produced by Aquasil was less, and the difference was clinically significant with retraction cord and NoCord [Table 2]. The P value was calculated to be equal to 0.05. The observations were further subjected to Wilcoxon's signed ranks test and paired t-test to find whether the change in width produced is in range of clinical significance [Table 3], [Table 4], [Table 5]. It was inferred that the effect produced with all the three agents gave statistically significant results in terms of retraction produced in width. 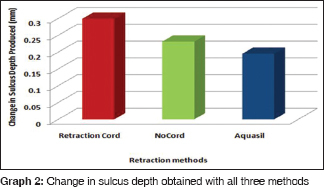 The change in sulcus depth was produced by retraction cord with a mean of 0.299 and a standard deviation of 0.04 which was maximum followed by NoCord 0.231 and a standard deviation of 0.04 and then Aquasil 0.195, standard deviation of 0.04 by one-way ANOVA test as presented in [Table 3] and [Graph 2]. Statistical analysis of the mean measurements for dimensional accuracy showed that both the impression materials, i.e., Aquasil and NoCord produced dimensionally accurate casts [Graph 3]. Fixed prosthodontic treatment involves the replacement and restoration of teeth by artificial substitutes to improve patients' comfort and masticatory ability, maintain health and integrity of the dental arches, and elevate the patients' self-image. The marginal integrity is one of the most basic criteria of the principles of tooth preparation. A harmonious relationship of the finish line to the gingival margins is of critical importance to the success of the restoration and health of the periodontium of the prepared abutment tooth. In view of the health of the periodontium, it is preferable to place the gingival finish lines of restoration supragingival or equigingival. For esthetics or other reason such as caries, existing restorations, and need for additional retention, the margin may have to be placed subgingivally. This requires some form of gingival displacement, for recording the finish line. Various materials and techniques like NoCord by Centrix USA have been introduced which claim to produce gingival displacement while recording the impressions itself. Aquasil as an impression material has been introduced long back, but its clinical efficacy as a retraction agent has not been tested. Therefore, a clinical evaluation and comparison of the efficacy of Retraction Cord, NoCord VPS Impression system and Aquasil on the basis of gingival displacement and the dimensional accuracy of the impressions was deemed necessary. A study conducted by Weir and Williams to compare the clinical effectiveness of mechanical–chemical tissue displacement methods showed that the maximum bleeding on removal was caused by dry retraction cords. Furthermore, the placement of retraction cord into the gingival sulcus may cause injury to sulcular epithelium and may induce bleeding on removal., Chemical impregnated cords are the most commonly used technique of gingival tissue displacement., Use of the cord impregnated with aluminum chloride (5%–10%) is referred to be the safest and most effective method of gingival displacement, and was therefore used in the present study. Aluminum chloride solution (10%) acts as hemostatic agent and astringent. It has ability to precipitate protein, constrict blood vessels, and extract fluid from tissues., It is highly soluble in water, freely soluble in alcohol, and soluble in glycerine. Aluminum chloride has no contraindications and minimal side effects when used in lower concentration.,,,,,, Runyan et al. in their study have stated that soaking of retraction cords in aluminum chloride does not reduce its ability to control hemorrhage in the gingival crevice. Laufer et al. investigated the length of the time medicated displacement cords should remain in the gingival crevice and concluded that the cords should be left for an optimum time of 4 min before impression making. However, in this study, the cord was placed in the gingival sulcus for about 10 min as recommended by contemporary textbooks on fixed prosthodontics. Among the chemicals, aluminum chloride is suitable because it causes minimal tissue damage in terms of inflammation, recession, and change in contour. The gingival health was checked using periodontal probe before every gingival displacement. It has been reported in previous studies, that the health of the gingival tissue returns to optimum when examined after 8 days of gingival displacement. Latin block design was used in sequence of gingival displacement to avoid the tissue fatigue in this study. It is a method of randomization of the displacement techniques to avoid any bias as the amount of displacement produced during the first displacement can be less when compared with the last used technique on a patient due to tissue fatigue. This would mean that the first and last techniques might be influenced by the amount and time of the displacement due to tissue fatigue and not produce gingival displacement solely depending on their own effect. Though 7 days has been advocated as the minimum time needed for the gingival tissues to recover if traumatized, a Latin block design that gives equal chance for each segment to be placed at different rank order of treatment was used in this study. All the measurements in the study were made by single operator to avoid interoperator variability. In the present study, maximum gingival displacement was obtained with aluminum chloride-impregnated retraction cord (0.271 mm) which is in accordance with many previous studies by Chaudhari et al., Weir and Williams, Gupta et al., and Prasad et al. where maximum displacement was obtained by the chemicomechanical method using retraction cord with astringent. NoCord also produced optimum displacement (0.26 mm) which was not statistically significantly less than the gingival displacement with retraction cord. It is a new material, and no previous studies have been done on it. Aquasil PVS was also checked as a retraction material for the first time and produced satisfactory gingival displacement (0.22 mm). Polyvinyl siloxane impression material is the material of choice of making the impressions for various clinical situations for making implant impressions, single tooth impression, fixed partial denture impressions, full mouth rehabilitation cases etc. It has been used as it produces dimensionally accurate impressions. Lacy et al. conducted a quantitative comparison of the accuracy and dimensional stability of representative products in each class of polyether, polysulfides, and PVS and showed that PVSs are the most stable of elastomers. Although Aquasil has been used from decades to record accurate impressions,, its efficacy as retraction agent has not been tested till date. NoCord VPS Impression system is a newly introduced gingival retraction system manufactured and marketed by Centrix USA. The company claims that it not only makes an accurate impression but alongside retracts the gingival for better marginal reproducibility. It contains a mega body cartridge and a wash impression cartridge along with gingival tips 0.5 mm in diameter. NoCord Wash contains 15% alum as the hemostatic agent to control bleeding and intracrevicular fluid. NoCord MegaBody Tray Material is a unique stiffer tray material designed to help drive the wash material into the gingival sulcus. The gingival tips available with the kit have a 0.5 mm of diameter which helps in pushing the wash material inside the sulcus. Being a new material, NoCord has not been previously tested for either gingival displacement or for dimensional accuracy. NoCord light body impression material used for gingival displacement has astringent (aluminum chloride) incorporated in it. Therefore with Aquasil, to produce the astringent effect, aluminum chloride 25% was applied into the sulcus with the help of intraoral gingival tips. It was kept for 5 min into the sulcus and then washed and dried before making the impression. For the measurements for dimensional accuracy measurements of the baseline control group, intraoral scanner was used as it produces accurate impressions. The conventional impression techniques produce difficulties such as inaccurate impression making, polymerization shrinkage, and errors in pouring dies. The measurements between the reference points in the casts obtained with Aquasil and NoCord impressions were made using Vernier calipers as used in previous studies. This study concluded that all three retraction systems are reasonably acceptable as per the results, as all three provide retraction more than the minimum amount of retraction (0.22 mm) required for any fixed partial denture impressions.,,,, Within the limited scope of the study, it indicates that the use of paste system was painless and is quick and easy, therefore, saving chair side time. Though all the possible care was taken to standardize all aspects of the study, every patient's physiology may have differed and hence the response of the gingiva to the retraction material. The result of this study needs to be verified for a larger sample size, in variety of situations such as anterior and posterior teeth, maxillary and mandibular arches for different gingival biotypes in different age groups. From this study conducted under standardized clinical conditions, the following conclusions can be drawn. All the three methods produce optimum level of gingival displacement required for making elastomeric impressions. Retraction cord produces the maximum displacement followed by NoCord and Aquasil. NoCord and Aquasil can be used to save chairside time and produce dimensionally accurate impression while also displacing the gingiva in the same time. Aquasil which is a routinely used material for making impression can be used as a gingival displacement material as claimed by NoCord following the similar technique. Baba NZ, Goodacre CJ, Jekki R, Won J. Gingival displacement for impression making in fixed prosthodontics: Contemporary principles, materials, and techniques. Dent Clin North Am 2014;58:45-68. Forgia AL. Tissue retraction for fixed prosthesis. J Prosthet Dent 1961;11:480-6. Baharav H, Kupershmidt I, Laufer BZ, Cardash HS. The effect of sulcular width on the linear accuracy of impression materials in the presence of an undercut. Int J Prosthodont 2004;17:585-9. Azzi R, Tsao TF, Carranza FA Jr., Kenney EB. Comparative study of gingival retraction methods. J Prosthet Dent 1983;50:561-5. Reiman MB. Exposure of subgingival margins by nonsurgical gingival displacement. J Prosthet Dent 1976;36:649-54. Rayyan MM, Hussien AN, Sayed NM, Abdallah R, Osman E, El Saad NA, et al. Comparison of four cordless gingival displacement systems: A clinical study. J Prosthet Dent 2019;121:265-70. Shillingburg HT, Hobo S, Whitsett LD, editors. Fundamentals of Fixed Prosthodontics. Chicago: Quintessence; 1997. p. 260-76. Ruel J, Schuessler PJ, Malament K, Mori D. Effect of retraction procedures on the periodontium in humans. J Prosthet Dent 1980;44:508-15. Chandra S, Singh A, Gupta KK, Chandra C, Arora V. Effect of gingival displacement cord and cordless systems on the closure, displacement, and inflammation of the gingival crevice. J Prosthet Dent 2016;115:177-82. Donovan TE, Winston WL. Current concepts in gingival displacement. Dent Clin North Am 2004;48:433-44. Smeltzer M. An alternative way to use gingival retraction paste. J Am Dent Assoc 2003;134:1485. Burrell KH, Glick M. Hemostatics, astringents and gingival displacement cords. In: Ciancio SG, editor. ADA Guide to Dental Therapeutics. 2nd ed. Chicago: American Dental Association; 2000. p. 104-18. Council on Dental Therapeutics of the American Dental Association. Hemostatics and astringents. In: Accepted Dental Therapeutics. 40th ed. Chicago: American Dental Association; 1984. p. 334-41. Csempesz F, Vág J, Fazekas A.In vitro kinetic study of absorbency of retraction cords. J Prosthet Dent 2003;89:45-9. Pelzner RB, Kempler D, Stark MM, Lum LB, Nicholson RJ, Soelberg KB. Human blood pressure and pulse rate response to racemic epinephrine retraction cord. J Prosthet Dent 1978;39:287-92. Runyan DA, Reddy TG Jr., Shimoda LM. Fluid absorbency of retraction cords after soaking in aluminum chloride solution. J Prosthet Dent 1988;60:676-8. Donovan TE, Chee WW. Current concepts in gingival displacement. Dent Clin North Am 2004;48:vi, 433-44. Prasad DK, Hegde C, Agrawal G, Shetty M. Gingival displacement in prosthodontics: A critical review of existing methods. J Interdiscip Dent 2011;1:80-6. Reddy S, Prasad K, Vakil H, Jain A, Chowdhary R. Accuracy of impressions with different impression materials in angulated implants. Niger J Clin Pract 2013;16:279-84. Singh RG, Sinha P. Functional and aesthetic full mouth rehabilitation of a severely worn dentition to restore vertical dimension: A case report. J Indian Prosthodont Soc 2014;14:210-4. Lacy AM, Fukui H, Bellman T, Jendresen MD. Time-dependent accuracy of elastomer impression materials. Part II: Polyether, polysulfides, and polyvinylsiloxane. J Prosthet Dent 1981;45:329-33. Mangano F, Gandolfi A, Luongo G, Logozzo S. Intraoral scanners in dentistry: A review of the current literature. BMC Oral Health 2017;17:149. Raipure P, Kharsan V. Comparative evaluation of dimensional accuracy and surface detail reproduction of elastomeric impression material when treated with three retraction cord medicaments: An in vitro study. Int J Dent Med Res 2014;1:12-20.